I hope you enjoy looking through my art, even though there isn't a whole lot here. If you're interested in seeing more of my artwork, you can find me on DeviantArt, where I'm much more active. I've got two accounts there; spuds-pokemon for pokemon related stuff and runningspud for everything else. March 3, 2019, 3:46 p.m. It's a strawberry tiger :). Enjoy! I do have some canon TLK stuff sketched out that's been sitting on my computer for a while now, but it hasn't gotten very far since I've been on a kick of doing my own content recently. Hopefully someday they'll see completion, and I'll post them here if/when they do! Dec. 24, 2018, 3:52 a.m. This has been a big progress year for me! TLKFAA has always been a cool place for me since it's the longest standing art site I've been on, so it's where I come to check my progress over the years. Sept. 19, 2018, 12:53 a.m.
Just a cheetah while I work on playing around with colors. Aug. 5, 2018, 1:49 p.m. This was intended to be something of a stylistic throwback to this from 2009: https://fanart.lionking.org/picture/462580/Lions.png . In the end they look totally different, but to be fair I like this current one a whole lot better. July 23, 2018, 12:45 a.m. I don't post on here often, but I do try to make sure I have something relevant to upload at least once a year. This is by far the oldest site I've got that I post my artwork to, and it's just become such a nice place to chronicle and look at progress over the years :). Anyways, here's an African wild dog. I've been trying to really establish something of a painterly art style, but am still working on finding my way with it. Feb. 26, 2018, 4:11 a.m. Working on developing some kind of painterly style, but I'm still not quite so sure what I'm doing xD. So, have a tiger? If anyone has any digital painting tips or critique to offer, I'd sure be happy to hear it! Dec. 29, 2017, 7:37 p.m.
Anyways. It's a Simba. On a rock. Dec. 17, 2017, 5:08 p.m. I found this little gem sitting incomplete in a folder since July of 2016, which I had completely forgotten about. The drawing overall isn't quite up to my standards anymore, but seeing it gave me a smile on a crappy day (I've been petsitting for two weeks now and woke up this morning to find that the geriatric cat I was watching had very unexpectedly passed away overnight) so I felt that it deserved to be completed. April 7, 2017, 8:24 p.m.
For many many years now I've been using TLKFAA to chronical my artistic progression. I don't create a ton of relevant TLK artwork these days, but I try to make at least one piece per year to upload here. Sadly, 2016 was the first year that I missed an upload since joining in 2009! June 3, 2015, 7:57 p.m.
June 21, 2014, 8:49 p.m. I was showing a relative how drawing tablets worked, and a Simba popped out. May 3, 2014, 5:13 p.m.
Are you up there, Simba?" Nala wonders if her best friend is among the other great kings of the past. Hi all! Its been another long while since my previous upload (10 months this time). July 7, 2013, 11:04 p.m.
Over the years, I've come to like using my TLKFAA account as a way of tracking my artistic progress. For years, my uploads have been infrequent enough that I can really see how things have changed over time. Aug. 17, 2012, 6:31 p.m.
July 9, 2012, 2:17 p.m.
Cheetah. I don't think people really see my stuff here anyways, so I'm not gonna bother typing out a lengthy description ^^'. July 2, 2012, 11:28 p.m. The first time that Nala had ever pinned Simba to the ground, he had responded by fearfully crying for his father's help. It was something that the young lioness frequently mocked him for, and he assumed that she would probably never let him live it down. Simba: 'N-nala!!' The flattened cub looked around anxiously to see if anybody was around to witness how quickly his friend had tackled him to the ground. 'Knock it off, you're ruining my image!" June 9, 2012, 10:38 p.m.
Just a WIP. Of a lion. Yep. 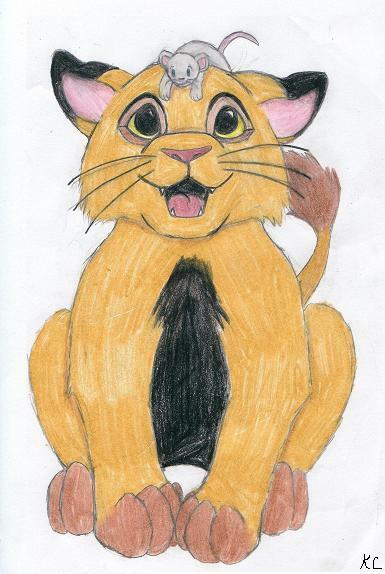 May 16, 2012, 5:06 p.m.
Simba, drawn with my tablet =). No refs used except to get Simba's colors. Feb. 10, 2012, 2:55 p.m.
Dec. 29, 2011, 8:58 p.m. I've been lurking around this site more often recently and felt like designing something for the trading tree. I hope there's at least one person who will be interested in adopting this lioness :). Dec. 29, 2011, 3:47 p.m. I got a tablet for Christmas and am really loving it =). Been drawing quite a bit since I got it. Dec. 20, 2011, 11 p.m.
Aug. 8, 2011, 10:18 p.m.
Well, since there are rabbits in Africa, I guess this qualifies as on topic art. So....here's a rabbit :P.
July 29, 2011, 6:20 p.m. This started out as a random scribble of a tiger, and ended with a number of drawings of these two. I'll very likely be uploading more of them in the near future, but their designs aren't final yet. June 2, 2011, 12:25 p.m.
Once again, its been a really long time since I've uploaded anything here. This time, its a snow leopard cub =). If anybody is interested in more of my stuff, I'm more active on deviantart than I am here. There, I can be found under the name RunningSpud. April 8, 2010, 6:39 p.m.
May 25, 2009, 9:35 p.m.
May 17, 2009, 8:36 a.m. I just downloaded GIMP, and this is the first thing I made with it = ). GIMP is a whole lot easier to use than the other program i was using, and i really like it so far. May 17, 2009, 8:35 a.m.
somebody mentioned how my original picture of Zip reminded them of their dog, and i kind of liked the idea of a dog-like cheetah. So i went and made new version of him (it hardly looks the same at all lol). what do you guys think? - is this version better, or should I stick with the old one? May 11, 2009, 4:27 p.m.
just a little running nala cub done on the paint program. yep, i'm still alive lol = ). i've been practicing, i just haven't uploaded anything recently (and track season took up a whole lot of my time). March 15, 2009, 9:31 p.m.
i like how this turned out, although the colors are much brighter in real life. i think this one reflects my own style a lot more than the other pictures i've been doing recently. March 11, 2009, 8:32 p.m.
March 9, 2009, 7:03 p.m.
As future king, Simba decided that he should have his own personal transportation. He won't be getting anywhere fast though = P.
Feb. 24, 2009, 11:06 a.m.
this is my new character Oreo = ). Feb. 23, 2009, 9:39 p.m.
Yay, its finally colored! it took a while but i'm really happy with how this turned out =D. Simba thinks he's tough, but the little frog doesn't seem to agree. Update: added some shading and such. Jan. 29, 2009, 5:39 p.m.
Jan. 16, 2009, 8:11 p.m.
just practicing with some effects. the cub doesn't look too good. Dec. 31, 2008, 12:20 a.m.
Nov. 30, 2008, 7:33 p.m. Practicing using my new art program by drawing a baby lion. i don't think he turned out bad =). Nov. 29, 2008, 10:19 p.m.
Yay, I finally uploaded my second art! This is Zip, the cheetah. He's unsuccessfully trying to catch the ribbon on his tail. I've never used this art program before, but hopefully it didn't turn out too bad. Nov. 25, 2008, 7:23 p.m.